The Industrial Welfare Commission (IWC) Wage Order #3 Canning, Freezing, and Preserving Industry is a general labor law poster poster by the California Department Of Industrial Relations. This poster is mandatory for some employers, including employers in the canning, freezing, and preserving industry. This poster, written in Spanish, must be posted in a conspicuous place where all Spanish speaking employees will see it for any Canning, freezing, and preserving Industry employers. This poster describes the standards and laws that must be followed in the Canning, freezing, and preserving industry. It appears you don't have a PDF plugin for this browser. 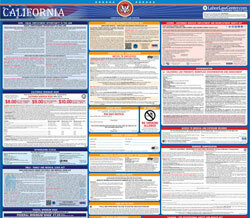 Please see the link below to download california-iwcarticle3.pdf. language, as well as  in  English,  if at  least  five  (5)  percent  of  the  affected  employees  prima rily  speak  that  non- English  language . shall ma ke the election  null and v oid. select a neut ral third par ty to conduct the election. hardshi p, the Division of Labor Standards Enf orcement may  gr ant an e xtension of time  for complianc e.
ecret  ballots may be cast  by affected  employees  in  the work  unit at  any  election  held  pursuant  to this  section. repor t shall include the final tally of the  vot e, the si ze of the unit, and the nature of the  business of the empl oyer. be required to  work those ne w wor k hours f or at least 30 da ys after the announcement of the final results of the election. orkw eek do not  exceed 30 and the total hours of empl oyment in an y one workday thereof do not  exceed six (6). consume such  food or dr ink. day’ s rest in s even (7). f or  those empl oyees of not less than 30 percent more than the state mini mum  wage. ag reement  expressly pr ovides otherwis e.